Join us to celebrate 100 years of advancing senior care! Our annual convention is the largest gathering of senior staff from not-for-profit long term care homes, seniors’ housing and community service organizations across Ontario. Of interest to Canadian Academy of Geriatric Psychiatry (CAGP) and the Canadian Coalition for Seniors' Mental Health (CCSMH) members are presentations from Dr. Debbie Kelly and Dr. Kristin Reynolds, Department of Psychology, University of Manitoba. Presenting during the morning concurrent session of the Symposium will be Debbie Kelly, PhD, Canada Research Chair in Comparative Cognition, Professor, Department of Psychology, Faculty of Arts who will discuss Comparative Studies of Spatial Cognition: What can birds tell us about aging? Orientation is the first step involved in navigation. Successful orientation allows us to establish our position within an environment, but failure to orient may leave us lost even within familiar places. Dr. Kelly’s research compares the spatial abilities of humans and birds across the lifespan to understand how aging affects orientation. This presentation will discuss current research studies showing similarities in age-related changes for the use of visual-based spatial cues by birds and humans. Population-based data from Canada and the United States indicates that between 3–7% of older adults ages 55 years and older meet diagnostic criteria for any past-year mood disorder. Despite the existence of effective, evidence-based treatment approaches, approximately 70% of older adults with mood and anxiety disorders do not use professional mental health services. Though many barriers to mental health service use have been identified, there is growing support that poor mental health literacy, defined as “knowledge and beliefs about mental disorders, their recognition, management, or prevention,” poses significant barriers to service use among older adults (Jorm et al., 1997, p.182). One tool that has been shown to facilitate knowledge exchange and participation in health care decision-making is the information decision-aid (IDA), which presents information about a problem, assessment methods, and treatment options. Research by Dr. Reynolds, collaborators (Drs. 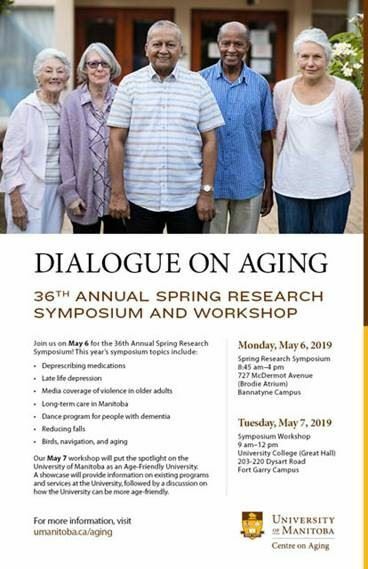 John Walker and Lesley Koven), and research assistants in the Health Information Exchange Lab, funded by the University of Manitoba Centre on Aging, sought to develop and complete a pilot-evaluation of an IDA focused on late-life depression. Throughout this plenary session, Dr. Reynolds will discuss the background research that led to this project, the components of the IDA, and the evaluative feedback from stakeholder groups. She will also review implications of the IDA, paying particular attention to the utility of the IDA in community and health care settings. On behalf of the 2019 Scientific Planning Committee for the Canadian Geriatrics Society (CGS), it is with great excitement we announce that early bird conference registration is now open for the Annual Scientific Meeting (ASM)! Check-in and onsite registration for the ASM will begin on Thursday, May 2 at 4:00 p.m. followed by a welcome reception from 5:00 p.m. to 7:00 p.m. Educational sessions will run May 3 and 4. Please click here to view the draft program. Join your friends and colleagues for the annual CGS Gala Dinner at the Casino Nova Scotia. Tickets are available for purchase when you register for the conference. A limited quantity is available, so please do not delay! Tickets will not be available for purchase onsite. 5th Annual CGS Fun Run/Walk: Saturday, May the 4th – The Course Awakens! The 5th annual CGS Fun Run/Walk will be held on Saturday morning – the invigorating route weaves through the Halifax waterfront and city streets and is a great way to see this beautiful city! Challenge your colleagues, create teams and fundraise to support the CGS Scholarship Foundation. The annual NGIG Student Day will take place on Saturday, May 4, during the ASM. The NGIG Student Day is organized by the National Geriatrics Interest Group for medical students interested in geriatrics. This is a great opportunity to learn from Canada’s leaders in geriatric medicine and meet fellow like-minded students from schools across Canada. Registration for the NGIG Student Day is free with registration to the CGS ASM. All students must be registered for the ASM in order to attend. This one-day course provides small-group learning opportunities for clinicians caring for geriatric patients in a variety of medical settings on common geriatric conditions such as delirium, osteoporosis, palliation in severe dementia, deprescribing and more. The concept of frailty and how to apply it to your patients will be interwoven throughout the program. Come join us for practical clinical education that you can apply in your daily clinical care. The CGS strongly encourages you to book your guest room at the Halifax Marriott Harbourfront Hotel. The negotiated conference rate is $199.00 per night, plus applicable taxes. The CGS conference rate is available until April 1; however, this rate is based on availability. Do not wait to secure your room as the room block fills quickly! For travel related to the CGS meeting, click here to take advantage of flight discounts. Canadian Geriatrics Society Call for Abstracts - Deadline January 27! On behalf of the 2019 Scientific Planning Committee of the Canadian Geriatrics Society (CGS), we are pleased to announce that the Call for Abstracts for the 39th Annual Scientific Meeting (ASM) of the CGS is now open! 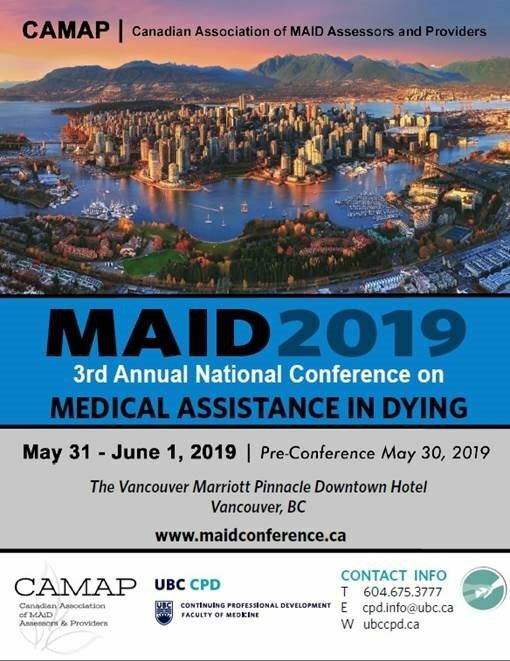 This year, the ASM will be held in Halifax from May 2 to 4, 2019, at the Halifax Marriott Harbourfront Hotel. The theme of the 2019 ASM is “Frailty: The Joy of Geriatrics”. Abstracts must contain original material that has not been published or presented at any other national or international meeting prior to the 39th ASM of the CGS. Abstract submissions will be accepted only through the online submission platform. More than one topic/theme is allowed per submission. Text only: upload of graphics, tables, images, etc. will not be available. The total length of the abstract (background/purpose, methods, results, discussion and conclusion) should not exceed 280 words, not including the title and authors. Once the online submission has been completed, you will receive immediate automated confirmation of receipt of your submission. Language of submission is English only. Allsubmissions will be reviewed for quality, relevance and merit. Please ensure that your abstract does not contain spelling, grammatical or scientific mistakes, as it will be reproduced exactly as submitted. Abstracts will not be proofread. Those who submitted an abstract will be notified of decisions beginning the week of March 4, 2019. Further details may be requested from those whose abstracts are accepted. Selected abstracts will be published in the ASM Book of Abstracts and in a future issue of the Canadian Geriatrics Journal (www.cgjonline.ca). Poster presenters are required to register and attend the CGS ASM and should be present at their poster location to answer questions during dedicated poster viewings throughout the ASM. Posters should be no larger than 3.5 feet wide x 5 feet high. These measurements must be strictly adhered to. Three awards will be presented for the best posters. Any trainee or student is eligible for this award. If the primary author is a student or trainee, the abstract submission will be considered for an oral presentation. The primary author MUST register, plan to present, and attend the CGS ASM to be eligible. All oral presentations will consist of a nine-minute presentation, followed by a three-minute discussion period, and will be scheduled throughout the ASM during the concurrent sessions. This prize is for the best scientific presentation by a post-graduate medical trainee (Core Internal Medicine PGY1, PGY2, PGY3, General Internal Medicine PGY4, PGY5 or Family Practice PGY1, PGY2) at the CGS ASM. This prize is for the best scientific presentation by a subspecialty resident (Geriatric Medicine PGY4, PGY5 or Family Medicine Care of the Elderly PGY3) at the CGS ASM. Graduate students are not eligible for this prize. This award is for the best scientific presentation by a medical student, health professional student or undergraduate degree student at the CGS ASM. For queries regarding abstract submission, please email events@secretariatcentral.com. For more information on the 2019 CGS ASM, please visit the CGS ASM website. THE CALL FOR ABSTRACTS IS NOW OPEN – deadline extended until January 6! Target audience: Interprofessional/intersectoral teams, family physicians and other primary care providers, mental health care providers, psychiatrists and psychologists, administrators and policy makers, other health disciplines working with primary care and/or community care, consumers and family members, educators and their students, and researchers. Please note that you can make edits to the abstracts up until Jan 6, 2019! Notifications will be ready in February 2019. The 2019 abstracts guidelines are available on our conference webpage https://ubccpd.ca/course/CCMHC2019. Dr. Patricia Conrod, PhD. Professor, The Université of Montréal, Department of Psychiatry. The personality-targeted approach to treating substance use problems was first developed and tested by Dr. Patricia Conrod at McGill University in Montreal, Canada (1995-2000). Dr. Anna Ratzliff, MD, PhD. Associate Professor, The Department of Psychiatry & Behavioral Sciences, University of Washington. A national expert on collaborative care and specifically, on training teams to implement and deliver mental health treatment in primary care settings. Dr. Cornelia (Nel) Wieman, MD, FRCPC. President, Indigenous Physicians Association of Canada. The first female Indigenous psychiatrist (Anishnawbe – Little Grand Rapids First Nation, Manitoba). In January 2018, Nel joined the First Nations Health Authority in BC as a Senior Medical Officer, Mental Health & Wellness, in the FNHA’s Office of the Chief Medical Officer. Dr. Evan Wood, MD, PhD, ABIM, FASAM, FRCPC, ABAM Diplomat. Director, British Columbia Centre on Substance Use; Professor, The University of British Columbia. Dr. Wood is a general internal medicine specialist and diplomate of the American Board of Addiction Medicine who has been responsible for the creation of a number of addiction clinical and clinical training programs. This award is for the best scientific presentation by a Masters, Ph.D. or post-doctoral student at the CGS ASM. TORONTO, Sept. 5, 2018 /CNW/ - Today, the Alzheimer Society of Canada is pleased to officially launch the first-ever Canadian Charter of Rights for People with Dementia. The landmark Charter is the culmination of over a year's work by the Society's Advisory Group of people with dementia, whose members represent different walks of life from across the country. With the number of Canadians with dementia expected to hit nearly one million in less than 15 years, the Advisory Group set out to define a set of seven explicit rights to give a greater voice and authority to those with dementia. The Charter will help people with dementia as well as their families challenge situations where they experience stigma, are treated unfairly, discriminated against, or are denied access to appropriate care. to participate in developing and implementing policies that affect their life. to access support and opportunities to live as independent and engaged citizens in their community. to be informed and supported so they can fully participate in decisions affecting their care and life, from the point of diagnosis to palliative and end-of-life care. to expect that professionals involved in all aspects of their care are trained in dementia and human rights and are accountable to uphold these rights. to access effective complaint and appeal procedures when their rights are not protected or respected. "People with dementia, no matter the stage of their disease, have the same rights as every other citizen," says Pauline Tardif, CEO of the Alzheimer Society of Canada. "Yet, we know all too well that Canadians with dementia continue to face cultural, social and economic barriers to claiming these rights, leaving many facing discrimination, isolation and treatment that contravenes their basic rights as human beings. We're asking all Canadians to champion this new Charter." The Charter will not only help combat the ongoing stigma associated with dementia, but also help inform a rights-based approach to the development of services and supports for Canadians with dementia. In particular, it will serve to guide the federal government as it follows through on its commitment to develop and implement a national dementia strategy for Canada. British Columbia resident Mario Gregorio, one of the Advisory Group members who contributed to the Charter, says, "As a person living with dementia, it gives me confidence to know that I'm not alone and reassurance that my country, my health and social services and my family, friends and community are there to lend a hand. We, as a nation, need to play a leadership role to ensure that people with dementia are not marginalized." Throughout the month of September, the Society will feature stories written by some of the Advisory Group members on what the Charter means to them, and invite others impacted by dementia to comment. To read the stories, learn more about the Charter and download a free copy, in English or French, visit alzheimer.ca/Charter. The Canadian Charter of Rights for People with Dementia is guided by a human rights-based approach known as "PANEL," endorsed by the United Nations. This approach emphasizes: the rights of everyone to participate in all decision-making directing their quality of life and care; accountability, holding individuals, communities and organizations responsible for recognizing, protecting and fulfilling their rights; non-discrimination, to self-advocate and challenge stigma; empowerment, to know their rights and how to claim these; and legality, to have assurance their rights are understood and followed according to law.